As a woman, you know that the clothes and accessories you choose to wear can say a lot about you. Watches are no different, so why not make a statement with the Tag Heuer Formula 1 Women’s Watch WAC1214.BA0852? This timepiece is fitting for the woman who wants to wear something that looks classy in a bit more of a formal, serious way, but still has a fabulous “fun” factor. And in this case, fun comes in the form of a pretty rock – diamonds! This stainless steel watch has a link bracelet that connects with a deployment clasp, silver-toned hands, and hour and minute dashes with numerals at every quarter-hour. 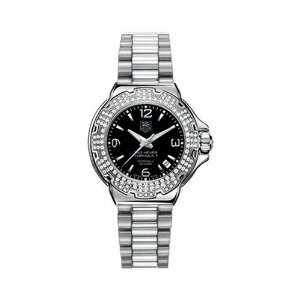 But easily the best part of this timepiece is the bezel embellished with the dazzling stones. Diamonds definitely give this otherwise plain watch the feminine touch it needs. Consumers who have purchased this watch have found that they were actually pleased to have the contrasting black dial paired with the diamonds and stainless steel as opposed to white or silver. Some were not as stunned by the diamonds on the watch as they had hoped to be, however, they may have not realized what exactly they had wanted in a diamond watch beforehand – all are different, and the studs on the Formula 1 WAC1214.BA0852 are miniscule but subtly beautiful. The least you can shell out for this watch is $1,880.00 on gemnation.com, with no tax or shipping fee. Amazon.com starts at the lowest price of $1,760.00 and even with a $167.67 tax and $4.98 for shipping, the total of $1,932.65 still beats out Jomashop.com at $1,975.00. To stand out in all the right ways, take a peek at the Tag Heuer Formula 1 White Mop Dial Watch CAC1310.CF6219. White watches are very much in-fashion currently, and you’ll still get your dose of diamonds as well!